Calculator Pro is the best calculator created specifically for Tablets and Phones! Undo, history, math, rounding and more in one calculator! At last, an easy-to-use calculator that combines all the features you need with special visuals and audible feedback! Only Calculator Pro lets you add and save comments on a scrollable history tape. Correct mistakes with the undo and backspace buttons. We now save the entire history tape and undo log so you can power off and resume work later. Use it like a personal assistant for grocery shopping. All on a single screen - great design with big numbers, buttons, display and history tape. Delivers 12 digit precision with commas for easier reading of large numbers. We've added optional key clicks for audible feedback. The six sound effects help distinguish between errors, operation keys, keypad keys, and others. Includes memory keys and popular math functions: 1/x, x-squared, square root. Great for school work! Quickly calculate a restaurant tip or tax without entering the rate every time. Our special currency mode makes it faster to balance your checkbook or do your taxes. Built-in advice with helpful tips. And pick from your favorite background theme, such as two high contract themes for those with contrast sensitivity loss. 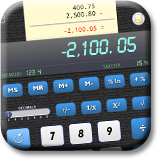 Personalize Calculator Pro the way you want it! For calculations, you control the decimal! Use the default floating point, or fix the decimal from 4 to 0 places. It even includes a currency mode for speedy entry of those pesky dollars and cents. It also supports your choice of rounding or not. For style, set the background to one of 12 slick themes, from brushed metal, camouflage, fire, ice-blue, purple haze, water, and more! Change the main display color to suit your fashion. It even allows changing the keypad from the standard 789 calculator layout to a 123 style arrangement. 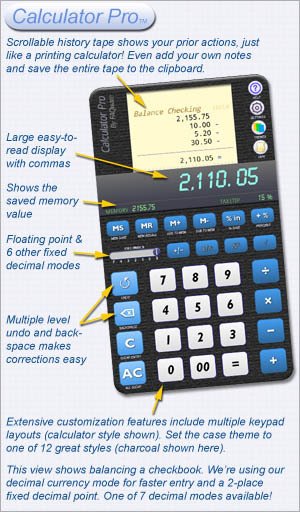 Great power and flexibility are always at your fingertips with Calculator Pro!